Summer weather is almost here, get your dates before they fill up! 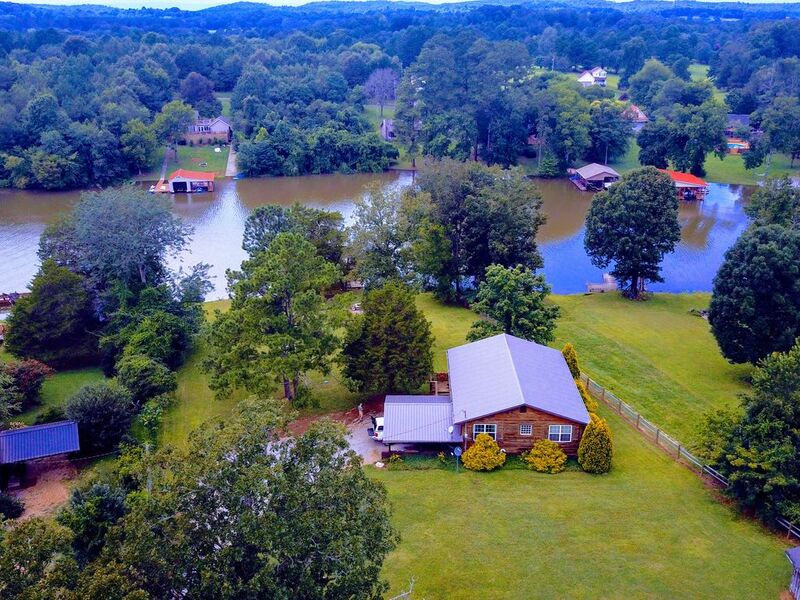 Cabin, 3 Bedrooms , 2 Baths on the water. Rustic, well appointed cabin with 2000 sq ft, on the water. This place has everything you need to have a great, relaxing vacation or just a weekend getaway! Loaded with all the luxuries you require for your vacation stay. It has a living room and a den, both have LCD flat screen televisions and the downstairs den has a home theatre system. The upstairs is where you will find 2 of the 3 bedrooms and 1 of the full baths. The brand new kitchen has everything you need and more. The kitchen is combined with the dining area and living room to become one large great room. Master suite is located downstairs with en suite bathroom. Also located downstairs in the den is a beautiful stone gas fireplace and a great card table for your enjoyment. Both levels have all windows facing the water so you can enjoy the reason you came. The great walk-out floorplan allows you to walk out on large upstairs screened porch, while the downstairs puts you out onto the completely covered grilling and dining area. The property also has a boat dock. The dock has a great area for sunning and a wonderful swimming area also. TVA controls water levels on this lake. We have summer level water normally from late spring to late fall. The water is lowered during winter months for flood control. You can check TVA.gov for lake levels on Chickamauga lake. 682.5 is full summer pool. toilet, shower, En suite master bath, beautiful!! This is a great place to stay, we enjoyed our week on the lake! Very nice place to stay!!! Very quiet, nicely decorated cabin on the river. The cabin had everything we needed. The beds were very comfortable and it was furnished very nicely. Rustic, cozy feel, would return. It was so pleasant that we wanted to extend but cabin was booked. Clean and well stocked. Would recommend. After looking at a number of similar places on similar lakes/rivers, this property on the Hiwasee River is where we decided to spend our week fishing and catching up with family. The pictures don't do the place justice as the house had everything we were looking for and then some. Everything at this property is well maintained, nicely appointed, and decorated accordingly by the owners. Tina was so very easy to deal with in the setup prior to our stay and she went above and beyond to let us know where we could shop, eat, launch boats, etc. once we arrived. The house has been redone and everything on the inside is quite nice. The property itself is huge and has all kinds of room for games, fires, grilling, and parking for both vehicles and trailers. The dock is also in good shape with power, lights, a nice table, and plenty of room for boats, jet skis, or any other vehicle you wanted to put on the water. Also, the ease of being able to choose from multiple boat launches close to this property was a nice advantage. I would highly recommend this property for anyone that asked and would gladly return to Tina's property myself in the future. Thank you, Tina! Great place for our spring fishing trip. Tina was awesome to work with and made sure we had everything for a relaxing stay. The house has everything you need and was very clean. Awesome place, great people to work with and friendly neighbors! If we decide to come back to fish in this area next year, we will want to stay here! I am so happy your trip was a good one and your had a great time! I can't thank you enough for taking such good care of the house! Thank you so much for making it such an easy transaction on my end too! You guys are always welcome and look forward to your return! 3 night minimum on ALL holidays!